Some reports say this church still stands, and others say it has been torn down. But rumor has it that whatever its state, it is haunted by four teen girls who some men hung on a cross in the loft before setting fire to the church. Witnesses have heard girls laughing, crying and flying around in shadow. ridiculous! this is a beautiful church just off the aa hwy between foster ky and california ky. yes it is there. no, there is no loft in this church that i can tell from the outside. and no signs of a fire or repair from a fire. This church still stands. My brother and I visited the grave yard while doing some family research. My brother took a picture of the church. 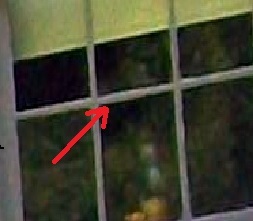 We didn’t notice the apparitions in the window until we got home and were looking at the pictures we had taken. The church couldn’t of burned down.